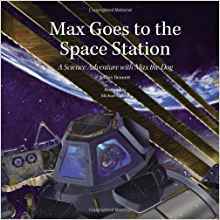 DESCRIPTION FROM THE PUBLISHER: The long-awaited prequel to the other books in the Science Adventures with Max the Dog series, this instalment follows Max on his trip to the International Space Station where he shares in the adventures of astronaut life and helps save everyone from a potential disaster along the way. The book teaches children to see themselves and the planet in a new light and encourages readers to discover how they can help make the world a better place. Accompanying the story of how Max saves the day are numerous Big Kid Box sidebars that offer science facts and other pieces of fascinating information. Grown-ups and kids learn about science together with this fun and educational picture book.